It's time for tacos. Or breakfast burritos, lunchtime fajitas, dinner quesadillas, or homemade Paleo tortilla chips. 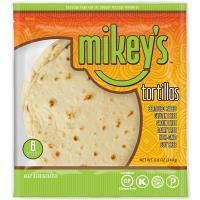 If you're in the mood for Mexican food, or just want to roll up a convenient, tasty meal, Mikey's Tortillas are the perfect solution. Made with just 7 simple Vegan ingredients, they meet every Paleo specification and surpass everyone's expectation for great taste.